Cook and drain macaroni. Set aside. In a large skillet over medium heat, melt 3 tablespoons butter and add shallots. Cook for 1 minute. Whisk in the yogurt, 1 1/4 cups of cheddar, 2/3 cup of parmesan, and beer. Continue to whisk over medium heat until a creamy sauce forms. Stir sauce into cooked macaroni. Sprinkle remaining cheddar, and 1/4 cup of parmesan into the macaroni and stir that in, as well, for extra cheesiness. Wipe skillet clean, then return to hot stove. Melt 2 tablespoos of butter in the skillet over medium-high heat. Toss the sliced kielbasa into the butter and cook until browned. Transfer cooked kielbasa to the top of the mac and cheese, stir slightly to mix into the pasta and cheese sauce. Wipe skillet clean once more. Melt remaining two tablespoons of butter into the skillet. Add garlic and toss in breadcrumbs. Cook until breadcrumbs are toasted and golden on most sides. Sprinkle with pepper and a touch of salt. Spread breadcrumbs on top of mac and cheese. Sprinkle with remaining parmesan. Bake in preheated oven for 20-25 minutes, or until cheese mixture is bubbling and breadcrumbs are firm and toasted. Serve and enjoy! In honor of September 28 Drink a Beer Day how's abouts we turn a bowl of homemade Mac into a beer fest and EAT our beer?! 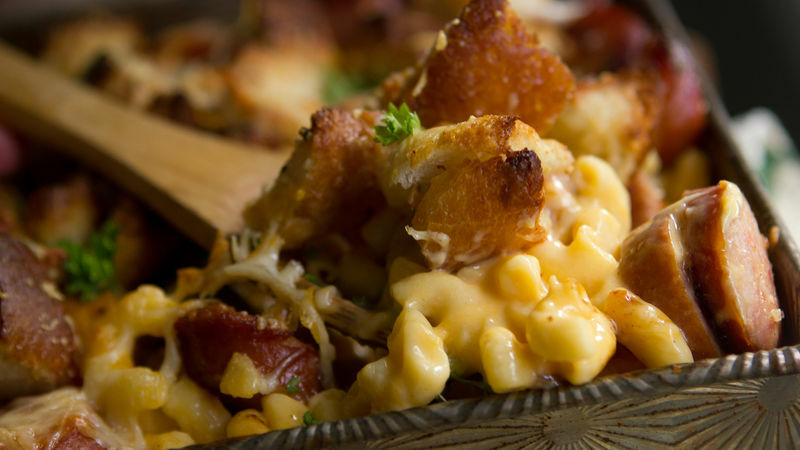 Extra creamy mac and cheese gets a flavor boost from craft beer and extra sharp cheddar. A topping of homemade garlic-pepper-parmesan breadcrumbs (these things are gonna make you squeal with delight) top this dish off in style! Here's how it all begins. Mac. Cheese. Beer. Need we say more? Mix together this gorgeous, creamy cheese sauce by whisking together cheese, a smidgen of yogurt, and a nice, local ale. For cooking, it's best to use a lighter, more blonde, craft beer rather than a full-flavored ale. Darker beers can taste bitter when added with other ingredients. You're also gonna brown up some kielbasa. Then bake and cube a loaf of Pillsbury bread. Because you're yummy like that, and homemade croutons are the most yummy things in the world. Layer it all together in a greased 9x9-inch pan or baking dish. Mac first, with a bit of extra cheese stirred in. Kielbasa, baby. Put it on top of your mac and cheese, then stir it in just slightly. Breadcrumbs and more cheese goes up top. Bake until golden brown and the cheese gets bubbly. Then set out giant dishes and call your people to dinner. It's time to eat. Extra beer encouraged for sipping. This is one flavor pairing you could call… inspired perfection. Check out the Munchies 2013 Craft Brewery Winner! Brooke blogs at Cheeky Kitchen where she shares crazy simple, healthy family recipes. She joined Tablespoon to share some of her best, so keep an eye on Brooke's profile.